This was an interesting book. I've been avoiding most YA that deals with high school for a while now, but I figured because this one was also a thriller, I could handle it. While it took me a little bit to get into this one, I did enjoy it once I was able to get going with it. 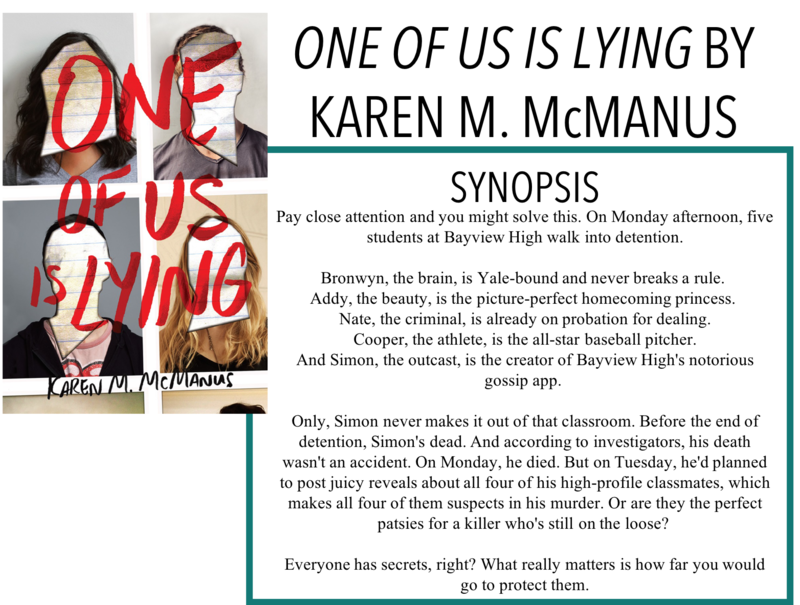 I am back with another book review, One of Us is Lying by Karen M. McManus. This story follows the perspective of four teens: Bronwyn, Nate, Addy, and Cooper. After the four of them are sent to detention for having their phones on them during class, they aren't pleased. Especially when they all claim that the phone that was confiscated wasn't their own. When Simon, one of the other boys who was in detention with them ends up dead, fingers start getting pointed at the Bayview Four - the last people to see him alive. Amidst a murder investigation, Simon's gossip app posts rumours about each of the four and mysterious Tumblr posts appear, seemingly coming from whoever killed Simon. As the four try to clear their names and prove their innocence, they learn that everyone has a secret - but who would kill to keep it? Like I previously mentioned, I had a bit of a hard time getting into this book. Even though we have Simon's death fairly early on in the storyline, not much happens in terms of an investigation until a few days in - which seem like eons when you're reading it. I kept waiting to get into the fast-paced thriller I had heard so much about. I will say, though, that once things did pick up, I enjoyed the storyline much more. McManus keeps the ending a secret for a while, and though the solution seems simple once you get to it, you can really appreciate the layers of the story she wove to keep things under wraps. I felt like some of the pacing could have been better. In terms of the initial scene with Simon, we don't really see enough of him to develop much sympathy for him. Obviously, it's horrible that he dies, but we'd only seen him for 3-4 pages by that point and he hadn't really shown himself to be particularly likeable. I would have liked to see that developed a bit more and maybe a bit less on the time between his death and the investigation. I did really enjoy the romance and other storylines that developed outside of the mystery. I'm torn because part of me wants to criticize the book for not focusing more on the mystery, but at the same time I know I wouldn't have been satisfied not knowing more about the other characters if that was the main focus. I won't spoil too much but we do see a m/m relationship develop with one of the main characters, as well as another romantic relationship with two others, which I really appreciated and thought were very well written. Overall, this may not have been the teen thriller masterpiece I thought I was going to get but I did still enjoy it.